DJs are the centre of attention at a party, whether we like it or not. We are entertainers and artists, and as such there's a healthy amount of ego to maintain - after all, confidence is an important part of performing at your best. However, it's all too easy for things to go to your head, especially if you've experienced some form of success and, perhaps, even power. It can be addictive to have that amount of influence over a small number of people, and as the audiences grow and the achievements roll in, managing that chip on your shoulder can start to become more challenging. Here are five tell-tale signs to watch out for as your success as a DJ grows. If you find yourself starting to behave in this way, check yourself while you still can - remember the saying: Be nice to people on your way up because you'll meet them on your way down. 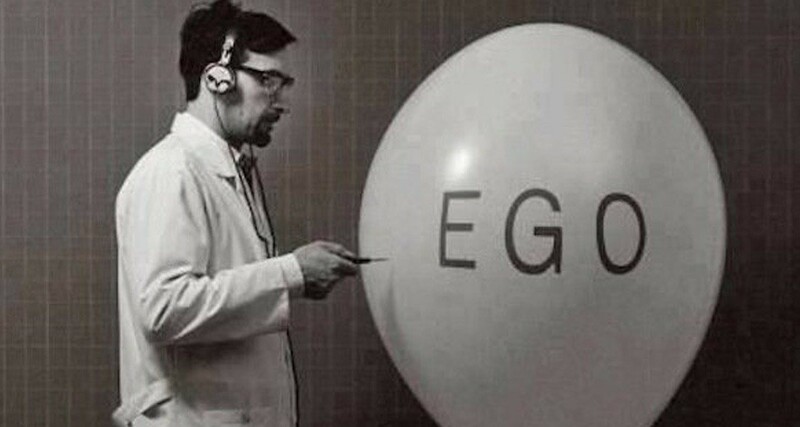 5 SIGNS YOUR EGO IS OUT OF CONTROL. If you lash out at promoters because you don't get the VIP treatment ("I said red M&Ms!") and get irritable because others DJs don't roll out the figurative red carpet when you enter the booth, then you've built some expectations about how people should treat you, just because you think you're a star. You could very well be the best, but you don't have to be an idiot about it. This is unhealthy because you expect to be treated differently, instead of fairly (ie like the rest of us mere mortals). Fuming at the booth technician because he won't plug in your laptop for you and arrange your cables? That's an expectation. Telling other DJs to "tone down" their sets because you're the star of the show and you're the only one who gets to play the big tunes? That's another expectation you have about yourself. Realise the situation (ie that you're behaving like an egotistical douche), and slowly work away from it. The two operative words there being "slowly" and "work" - deflating your ego is a painful process that takes time. It's painful because even little doses of humility hurts the ego a whole lot (especially if you're a dude, according to science). Expectations are at the root of ego, but the good thing about this is that it's all in your head. Letting go of your expectations of others lets you be at peace with the way you're treated, whether you like the way you are treated, or not. It also makes you a generally more pleasant person, instead of someone perennially uptight because you didn't get what you want. 2. You throw a hissy fit when the DJ before you plays "your songs"
Unless you're a headliner with your own productions, when the DJ before you plays a track that you've been identified with, don't feel robbed. After all, the truth is other DJs almost certainly have played those songs at some point in time (albeit not at the same venue, and right before you go on), and you have absolutely no ownership over them. You're only associated with them because you've played them before, not because you "made" them, even though you may have been the first to break them to your audiences. Don't freak out - there are tons of other songs that would elicit the same reaction from a crowd, you've just got to go through your playlists to think of a suitable alternative. We recommend packing crates that have two times the amount of music that you think you'd need for a gig, and you'll be digging deep in those crates when situations like these arise (they're more common than you think, to be honest). I'm a damn narcissistic person (It's taken me 30 years to come to terms with it). When I was a lot younger, I'd get pissed when another DJ would make a crowd go nuts instead of me. It would ruin my mood for the rest of the evening, and if I was about to go on it would make me feel like crap while I mixed. Not a good thing, obviously. The DJs in a lineup aren't competitors for some imaginary "Best Slot Of The Night" trophy. Instead, think of all of you as a team that's building a great evening of music together. All DJs in a billing have got their own roles to play - just because you're the headliner doesn't mean you're the only one who should have the satisfaction of making people dance. If people leave the venue happy, they'll get talking about it and you will, by association, be a part of that success. You're busy and you've got a schedule to keep, we get it. But it's not a good look on you when you start screaming at the promoter because you don't get to go on at exactly midnight, or that your set extends a half hour because the other DJ just arrived following an emergency, and needs a few minutes to get ready. Gig schedules and lineups, like other plans, often have to change at the last minute - it's a fact of life, no matter how organised event planners try to be. Adjust your expectations and be realistic - always make some allowances for delays. If it's a small event that's running a half hour late because people are coming in the door later than usual, trust your promoter when she or he says that it'd be best to move your slot a little later. Don't be a pushover, though: If your slot moved from primetime to after hours or opening, you may want to negotiate and stand firm, because that could be other DJs muscling their way to better time slots. "All these young folk DJing with their personal computers and fancy graphics, bah!" If you catch yourself sounding defeated, that's a sure sign that you're becoming an aging cynic. Constantly reminding people of how DJing was better back in your day makes you look like a pompous, self-absorbed has-been refusing to climb down from your yellowing ivory tower ("Spotify gets you access to all music now, it's too easy! Where's the fun in that?"). Let other DJs have their fun. You've undoubtedly had yours (that gig that lasted an entire weekend back in college, spinning at your mate's birthday and relishing in his effusive admiration, and so on). If you've hit a rough patch in your DJing, or you feel like you're stuck, don't feel like you have to hold others back because of you. If anything, you should feel inspired to pull yourself out of the muck and run alongside those who are enjoying success at the moment. Another thing to do is to simply enjoy the fact that we are in an industry that's constantly changing and evolving. For a stark contrast, imagine the world of classical music - when was the last time a major shift happened to playing the violin? I'm sure there were some changes, but not at a pace as rapid as in DJing, and that's what makes our chosen path as DJs special: we are always in flux because we have deep ties with technology. DJs are artists and entertainers. Whether we like it or not, there is an amount of validation and satisfaction that we get whenever we see people enjoying our DJ sets and performances, especially when we've worked so hard to reach a certain level of proficiency. But there's danger in letting this run away with you. As Zig Ziglar said: "You will get all you want in life if you help enough other people get what they want." A spirit of generosity and a healthy dose of humility will do as much to further your DJing career as your raw talent and enthusiasm. Or to put it another way: I've met many DJs over the years, and while not all the nice ones have gone on to be successful, pretty much all the truly successful ones I've ever known have been nice people as well as talented DJs.